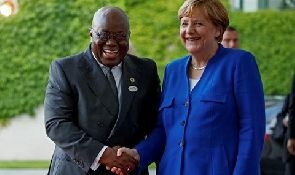 The Chancellor of Germany, Angela Merkel, will pay a day’s working visit to Ghana on August 30, at the invitation of President Nana Akufo-Addo. Chancellor Merkel and her Federal Minister for Economic Cooperation and Development, Mr. Gerd Müller are on a tour of different African countries but will meet in Ghana to round off their tour with a joint press conference with their Ghanaian counterparts, the German government announced. Chancellor Merkel and her high-level business delegation will be visiting a few Germany sponsored projects in Ghana, her itinerary reveals. Mr. Christoph Retzlaff, the German Ambassador to Ghana, in July announced Chancellor Merkel’s visit to Ghana is part of her three-nation Africa tour; which would also take her to Nigeria and Senegal. Mr. Retzlaff said the visit to Ghana would be the first of a German Chancellor to Ghana since 2004. Mr. Retzlaff said the visit would focus on economic cooperation and on promoting investment and business in Ghana. The visit would also be an opportunity to discuss and take stock of the G20 “Compact with Africa Initiative”, launched in June 2017 in Berlin under Germany’s G20 presidency. The Ambassador said Germany was supporting Ghana through long-standing development cooperation programmes as well as a new bilateral “Investment and Reform Partnership” launched in December 2017. The cooperation brings an additional 100 million euros of German development funds to promote renewable energy and energy efficiency in Ghana, and to foster private investment into renewable energy as well as vocational training in the energy sector. Mr Retzlaff said another highlight of German-Ghanaian relations would be the “German African Business Summit (GABS)” in Accra from February 11-13, 2019. 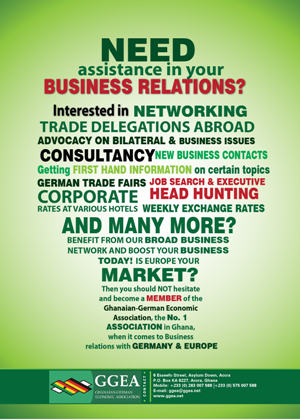 The GABS is the German signature business event in Africa. Top business and government leaders from Germany and Sub-Saharan Africa meet every two years in Africa to promote economic relations between Europe´s largest economy and the fastest growing region in the world. Up to 750 leaders, decision-makers and business representatives are expected to participate. The GABS is organized by the Sub-Saharan Initiative of German Business (SAFRI).